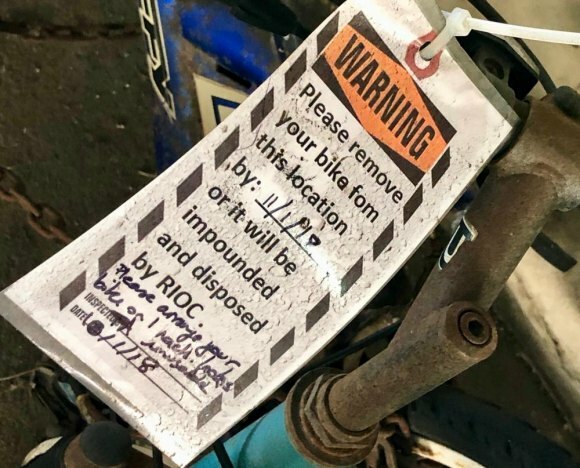 Home » Island News » Did RIOC Abandon Its Abandoned Bike Policy? Did RIOC Abandon Its Abandoned Bike Policy? Abandoned bikes in one of several heaps under the Roosevelt Island Bridge Helix. 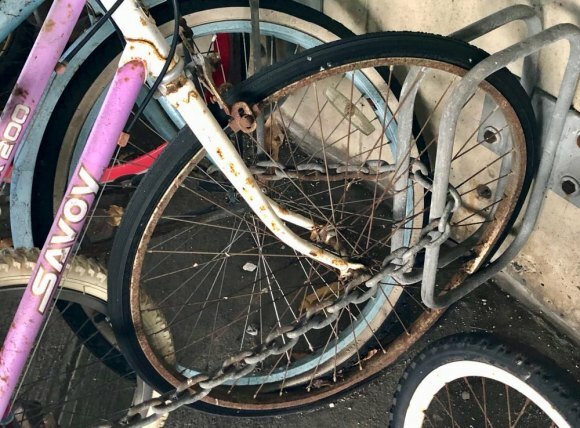 After a report in The Daily, spurred by reader complaints in August, RIOC announced a comprehensive policy for removing numerous abandoned bikes clogging storage areas throughout the idea. Just as quickly, it seems to have become as abandoned as the bikes still rusting in heaps. 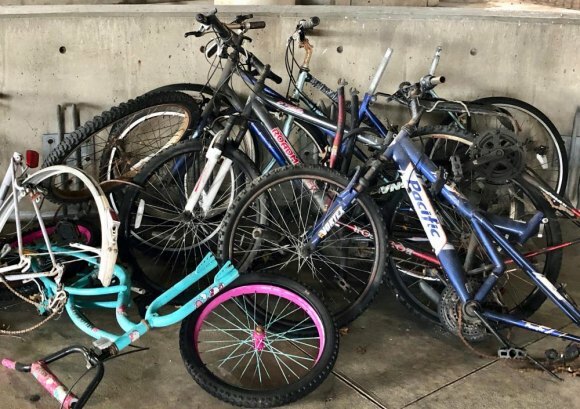 Scouting around the Motorgate Atrium area for another story this morning, I found numerous bikes, tires flattened, rims corroded, seats missing, in piles in the parking area under the Roosevelt Island Bridge Helix. Tag left while RIOC program was still operative, not accumulating dust. One even sported a tag warning that, if not removed by November 1st, six weeks ago, it would be "impounded and disposed of by RIOC." Back in shirtsleeve weather, I inquired about implementation or the policy. 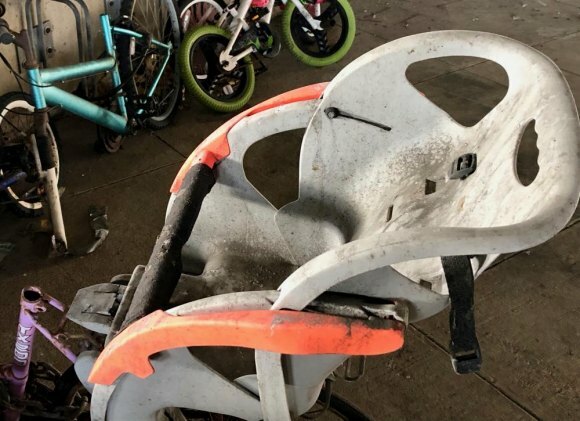 A left behind child seat is the only seat left on this bike. RIOC did not immediately respond to a follow up request sent earlier today. 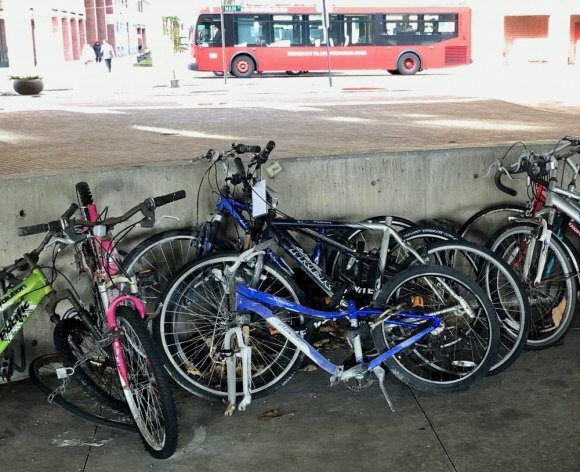 As it stands, bikes are not all that's been abandoned, as the policy, admirable and much needed as it was, appears to have been short-lived, surviving only one month. Flat tires and rusted rims tell a story of how many seasons these have suffered under the helix. Rusting bikes, it appears, will continue blotting the landscape for the foreseeable future. Another abandoned bike heap, just steps from Main Street.